Here’s something you can really sink your teeth into – a calculator from the Tax Foundation which will let you input your tax data. What does it output? Well, your tax burden under the ‘Bush’ tax cuts (passed in 2003), your tax burden if the plan expires, and your tax burden if the changes in President Obama’s budget are enacted. Now that you have this data, you can cut through the noise and choose which one you like the best by simply figuring out under which plan you owe the least! Joy! How Does it Affect You, PKamp3? Funny, I thought you wouldn’t ask! 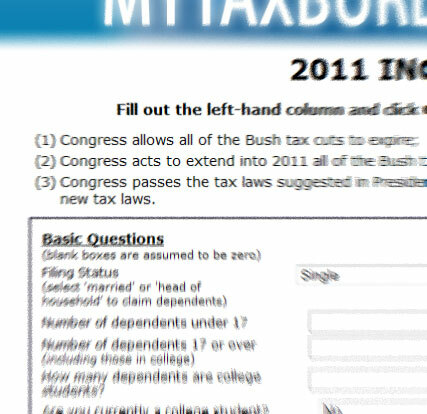 If the Bush tax cuts expire, my tax burden will increase by 11.83% in 2011 assuming I make the same amount. The worst thing about increasing taxes is even if one doesn’t get a raise (for example, because hiring remains weak) the amount they have to live on decreases from the previous year. Even though you get the same salary, you’ll have to make do with less after-tax money (call it a federally-mandated pay cut!). So yes, I prefer the cuts are extended. However, if the cuts are extended for folks like me while taxes increase on the highest of the high earners, that isn’t automatically a good thing (who is going to create all the new jobs?). In fact, the topic is likely to be the next big battle we see in Congress, with odd alliances consisting of people from all political stripes. There’s nothing like a tax debate to inflame the passions of a nation, so let’s get this one going! Tax debate in the comments!